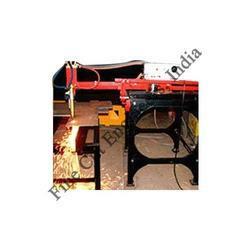 We manufacture a wide range of Gas Profile Cutting Machine, which is used for small workshops and maintenance department. These gas profile cutting machines are a cross carnage type with a rigid tracing table. The magnetic tracer traces the mild steel template and profile is as per shape at the template. Counted as first among the best, we provide patrons with the superior quality of CNC Gas Profile Cutting Machine. Manufactured as cross carriage type with a rigid tracing table, Portable CNC Profile Cutting Machine is ideal for cutting applications at workshops. Our customers can avail the Portable CNC Profile Cutting Machine in various technical specifications. Looking for Gas Profile Cutting Machines ?